I can’t say enough good things about my staff. They are just amazing! Assistant trainers Lisa and Lauren teach their asses off, even while Lisa is on the injured list. My barn manager Hannah and my working student intern Skye work like dogs, and they always have a smile on their faces. I’m so fortunate to have them! I’m also fortunate to have my young horses, who make me smile every day, though Puck makes me frown in between the smiling from time to time because he’s not yet convinced that he’s a Good Boy full time. It’s still a part-time position, and I had an enlightening moment about straightness and alignment that has made him better in his back when he isn’t angry at me for making him straight. Swagger has never been angry a minute of his life, and he continues to be the wonderful Labrador-retriever-puppy-in-horse-clothing I’ve known and loved since Day 1. Michael was in town recently, and I took a lesson in which he kept saying, “Nice, good job, go the other way, he looks great, you can’t ask more of a 4-year-old.” And that lesson was fine by me, because it confirmed everything I know. At some point the bar will be raised in the daily work, but it’s not soon. Both of them had the bar raised this weekend, when I took them to Morven Park for the first show of our northern season. 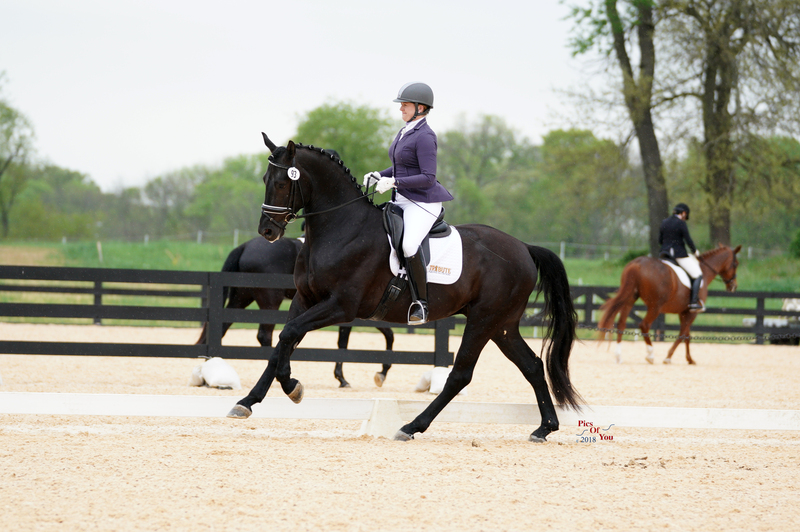 Swagger showed in a Materiale class, where he received very high marks, and at training level, where he didn’t because at training level the judge is looking for great steadiness and consistency, and Swagger is way too wiggly to be a training level rockstar. I’m not losing any sleep over this—my dreams for him lay farther ahead than that! And independent of scores and ribbons, the weekend was a huge win for Swagger. He was just a model citizen, really really reasonable; there were a few moments where I needed Lisa to put a hand on him from the ground to get him past a scary object or moment, but that was it. He didn’t run or panic or behave in a stupid fashion. And he still had a ton of energy on Day 3. Swagger was a good boy at his first outing. Photo by PicsOfYou.com. Puck went as a non-compete, and he showed me why we need to do this more often by being tight as a tick and a little explosive about it. But we reached common ground by the end of the weekend, and I know these will be funny stories when he’s a top upper-level horse with a ton of coping skills, but right now I just take lots of deep breaths and solider on. 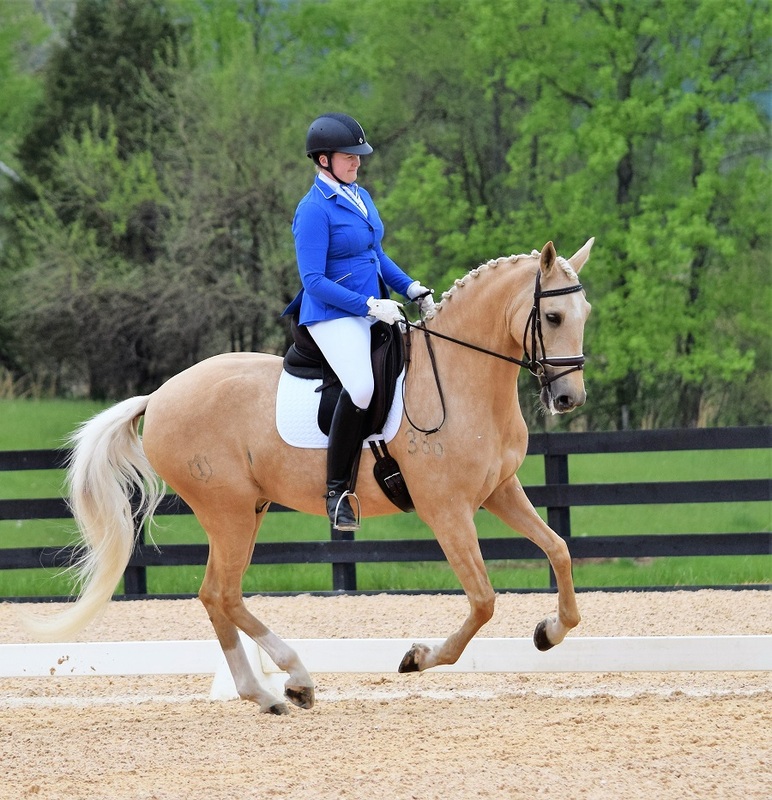 I also showed my mom’s amazing little palomino Lusitano, Helio, who has gotten vastly steadier since his show debut in Florida. He won a huge first level class and scored above 70 percent both days, and he got to meet lots of people who come up and say, “OMG HE’S SO CUTE!” which is always pretty fun. And Helio earned big scores! Photo by Janet Gallay. Morven Park has finally moved forward on their big construction project and made new arenas, with phenomenal new footing. It’s been a long road for them, and I’m so glad it’s as gorgeous as we’d all hoped. I’m not sure what’s next for any of the boys competition-wise, but I’m happy their future is bright!